Current lifeguard station in South Mission. South Mission residents and property owners are opposed to a new 4,000 square foot lifeguard station currently being built by the City of San Diego – while OB residents can’t get funding for a new lifeguard station here. The City began construction recently on the 30 foot facility in South Mission. Meanwhile, OBceans found out just recently that there’s no funds for the OB station in the current budget being proposed by Mayor Faulconer – who used to represent OB while on the City Council. 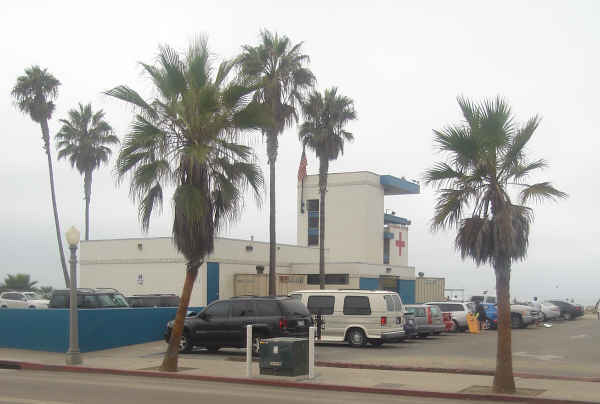 The City says that it vetted the new tower with the community of Mission Beach and that the old one is over 40 years old and deteriorating, thus needs replacing. The new tower being built is not the main Mission Beach lifeguard station, however, that’s north down the beach near Belmont Park, a more centralized location. OB Lifeguard station, circa 1983? In contrast, the current OB tower was built in the early 1980s (we believe 1983), so it’s not as old as the South Mission one. But it’s OB’s main tower and it too has deteriorated greatly. Lifeguards have complained over the years, particularly about the interior stairs. Meanwhile, San Diego media has described how local residents and property owners in South Mission are “pushing back” against the City’s construction of the new tower, and some are threatening legal action to stop its building. Their main complaints are around lack of sufficient notice, lack of input and the loss of views. The new 3,809-square-foot facility will include a first-aid station, a rescue vehicle bay, 2 observation decks, and administrative areas. The City says that the new design will minimize any negative impacts to views of the water, and will meet the needs of the community for another 35 years – up to 2050. According to the City, as reported by media sources, the initial costs of the new tower back in 2002 when it was proposed was about $1.1 million. But since then, the costs has careened upwards to almost 5 times to about $5 million. This is due to ‘funding problems’ and erosion-control issues. The City also says that in 2007 a smaller design was approved but the current model is just slightly larger. The new design has also been approved by the Coastal Commission, as it determined that the new design was essentially the same as the first. A permit to begin construction was issued in March. And lifeguards will continue to use the old one until the new tower is built – scheduled for the summer of 2015. 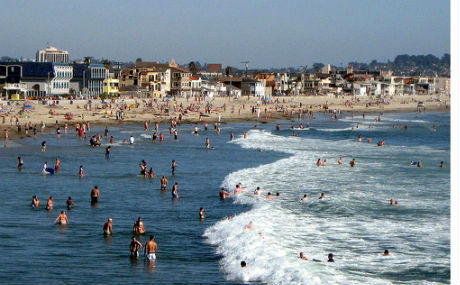 These critics – mainly property owners along the Mission Beach Boarewalk – assert that the city failed to properly notify stakeholders, and actually sent letters to rented-out residences rather than to property owners. Also, they complain that public notices displayed the new tower at 3,125 square feet, not the 3,809-square-foot tower in construction. It was reiterated by the City that it followed all of the necessary rules to inform Mission Beach, that it held community meetings and asked for the community’s feedback. Whether legal action will suffice to force the City to change its plans and whether the rest of Mission Beach supports these South Mission property owners – some whom at least live in Arizona – remains to be seen. Unfortunately, there isn’t too much of a “community” remaining in Mission Beach, as much of it has deteriorated into 3-story gentrifying Mansions, expensive condos, time-shares, and vacation rentals. Over the decades, it’s lost much of its community-serving public infrastructure and has devolved into a super-expensive tourist and vacation haven. But, there’s always hope. Perhaps next year’s budget will include funds for a new lifeguard tower in Ocean Beach – where there still is a community. i was inside the ob one today, just the entry room. its totally classic, same feel as when i was a kid. That bench where anyone who’s needed a bandage sat for years and years. the guards there are the best around, watermen making their living. 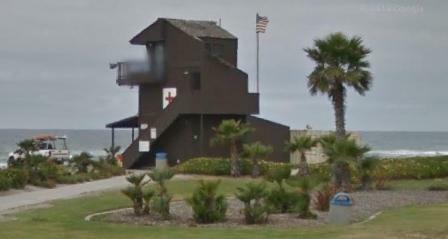 The ob lifeguard tower is epic. Should it be updated i won’t opinion on but thats one classic building thats served a lot of people really well. Classic part of our neighborhood. today they called me a locksmith after i got a little too stoked to get in the water and locked the keys in the car. problem solved real quick. We should talk about a lifeguard appreciation day, we have the best around, always have. I agree with M.B. that public review process is important. If the O.B. Lifeguard station is rebuilt it needs to have public review. I would hate to see it taking away any public parking or just be a big block of a building that is a bookend to the one across the parking lot. I would prefer to get the library design the community supported in 2003 built. The city bought the building next door to the library expansion and what have they been doing with the rent? Shouldn’t that money go toward building the expansion? San Diego has made a large amount of property tax money from home values going up in O.B. and the all the new businesses. Shouldn’t that go back into our community?… A library expansion… with maybe a O.B. historical section? That sounds good to me. Be careful what you wish for, ocean Beach , as a massive concretorium could be yours.